The smell of my house when the bleach load went in the washer was almost unbearable. 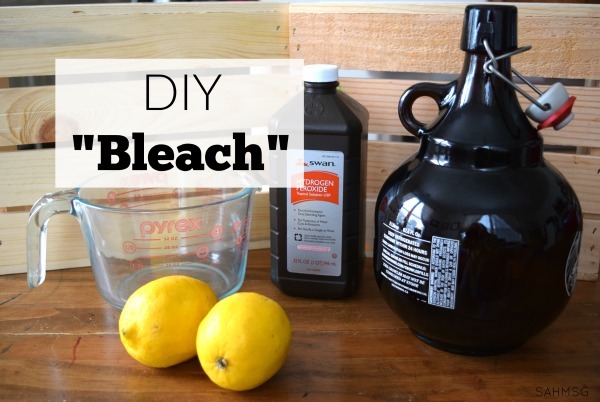 I am glad I found a recipe to create my own DIY bleach. I can’t even believe this exists! 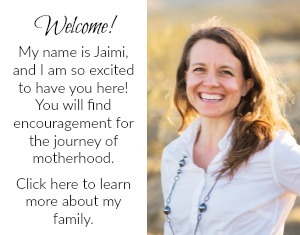 Two years in to exploring the world of essential oils has opened my eyes to all the options we have to take care of our homes and families in simple ways without exposing them to more toxins than necessary. Let’s face it, we can’t live in a bubble, so we will be exposed to chemicals that will seep into our lungs or soak into our skin. I want to limit that exposure for myself and my children as much as possible whenever I can. It just makes sense…for health and our wallet. 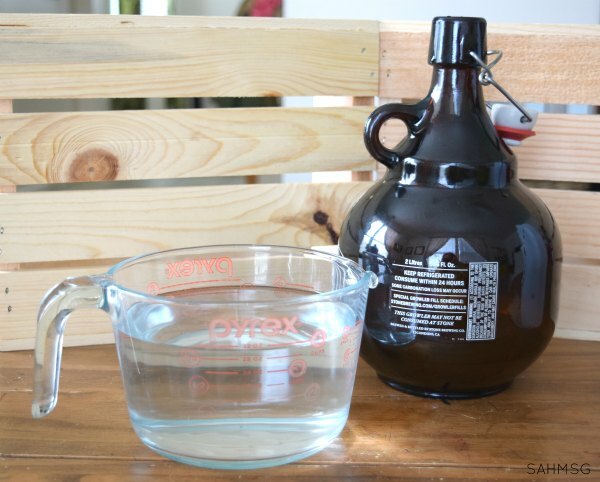 This DIY bleach recipe is so inexpensive and quick to make. I used it on my white load and found it to be very effective. I pre-treat any stains, so this worked really well when the stains were from food or natural materials. This even doubles as a carpet stain treatment! I’ll share the pictures with you. 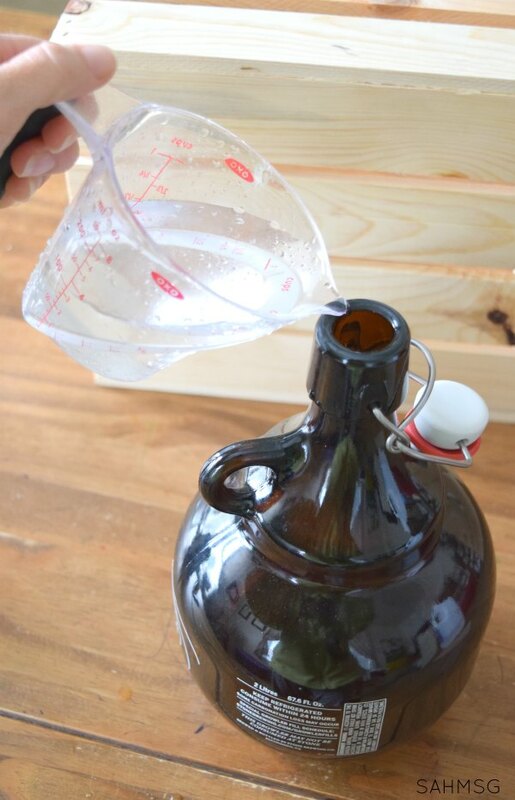 Pour 1 ½ cups peroxide into the glass container. Add in 1/4 cup lemon juice and 15 drops (or so) of Lemon essential oil. 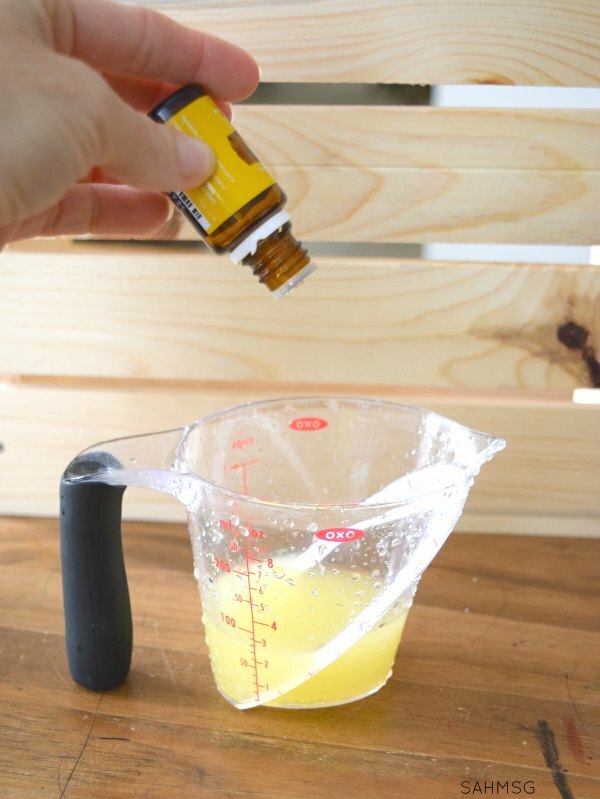 Lemon essential oil is the secret ingredient in this DIY bleach recipe. You can even use it as a laundry stain pre-treater. The original recipe I found said to use 1 cup per wash load. I think that is for an average load or “regular” load depending on the setting of your washing machine. With the container tightly sealed, I turn it upside down gently to mix all the ingredients before pouring out the amount I need in a measuring cup. I used 2 cups for my large (or super-sized) white load. Pre-treat any stains. I use Thieves dish soap to pre-treat naturally. It works so well! Let the washer cycle run. Dry as normal. 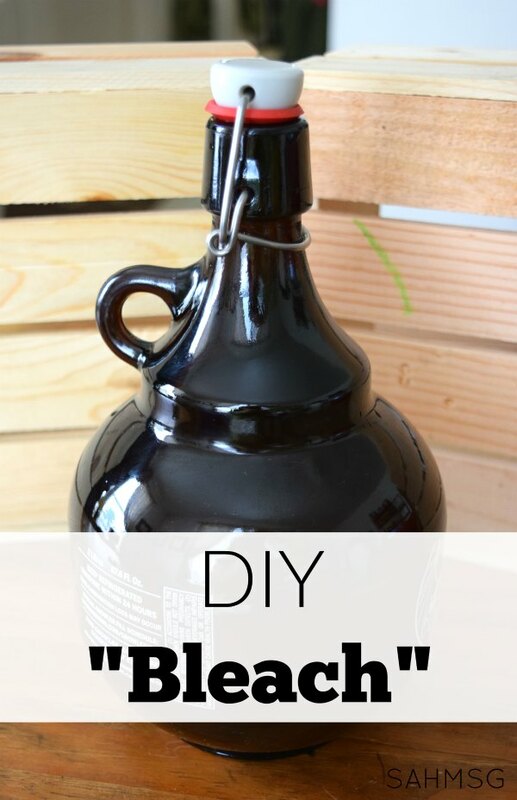 The freedom to make this DIY bleach when I need it is the best part! I used the DIY bleach as a stain treatment on my carpets too. I poured my DIY “bleach” right onto the carpet stains. It sat for about 10 minutes. I’d recommend that you wait 20 minutes. 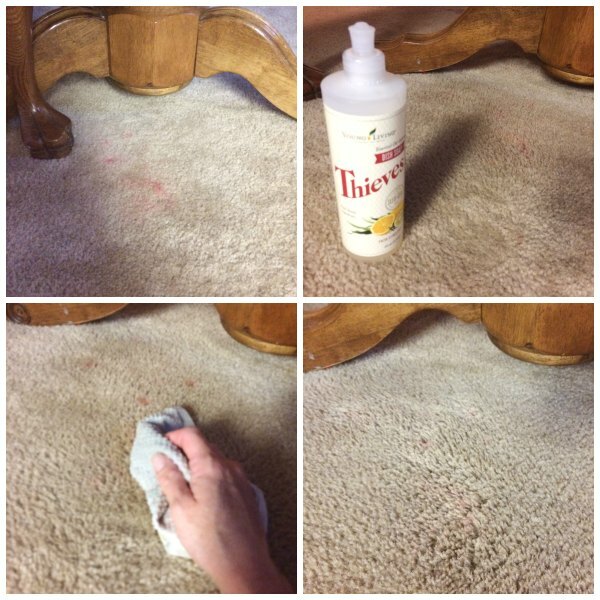 Then I squirted a little Thieves dish soap onto the carpet stain and let it sit for a minute before scrubbing the stain away. Repeat as necessary to remove your carpet stains. I do have a carpet steam cleaner similar to this one and love it. When I need to clean large areas of carpet, I just pour in 2 capfuls of my Thieves cleaner into the basin, fill with warm water and steam clean away. I did not use it to clean the stains above. It’s amazing the natural products we have at our fingertips to clean our home and keep our children safe from toxins in the home-as much as possible. That is why I do not buy essential oils in the stores. There is no regulation of essential oils, so any company can put the word “pure” on the label. Most cheap essential oils are cut with un-natural additives. I only buy Young Living essential oils. They are the oldest essential oils company and the only one with a Seed to Seal Guarantee. To get Young Living essential oils, start here to decide which kit fits your budget. Lemon essential oil comes in both the Basic Starter Kit ($45) and the Premium Starter kit (as low as $160). Retail customers can buy Lemon essential oil without a membership fee, but you won’t get the 24% discount that a starter kit gets you! Whatever your budget, there is a plan that will work! 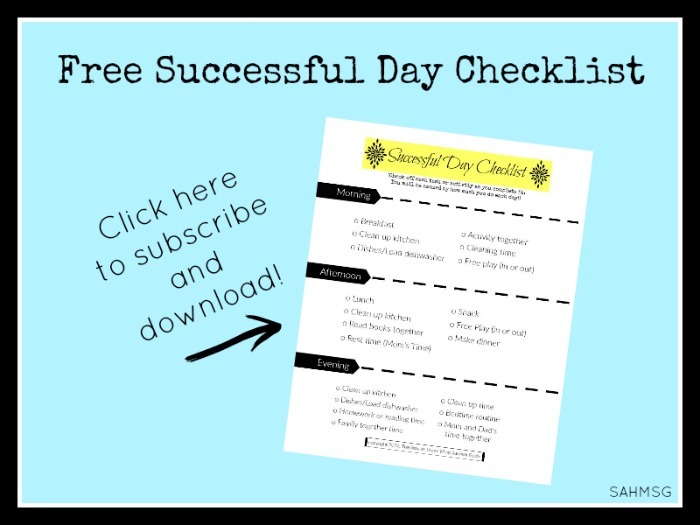 You can get started with essential oils here and I will send you your free gifts for signing up. 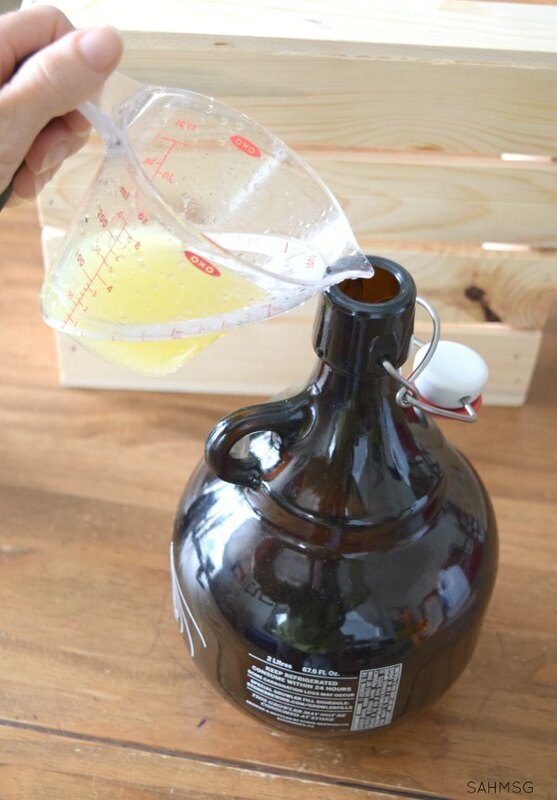 Have you tried making your own bleach? How did it work for you? 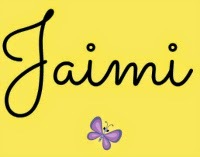 Hi Jaimi! This is a great DIY. 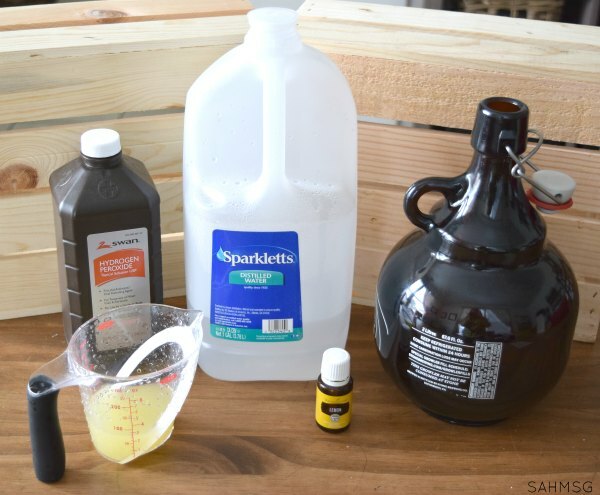 I have been looking for an easy and natural alternative to bleach for use around the house and our homestead. I also like doing DIY and natural remedies. I think you would find some interesting things on my site! Feel free to visit it. 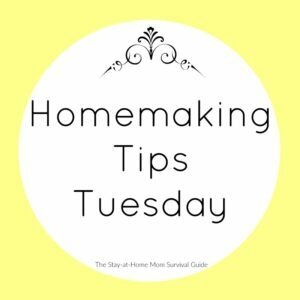 I am so glad you find this tip helpful. It works really well for my family. Thanks for stopping by!